Friday night was Kevin's friend, James pre wedding night, we were all invited to his house. 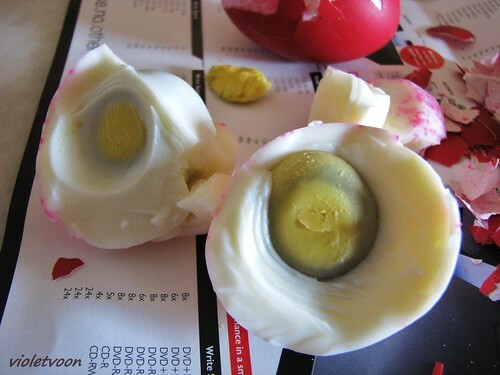 Before we left, his mum gave us 2 tinted eggs. 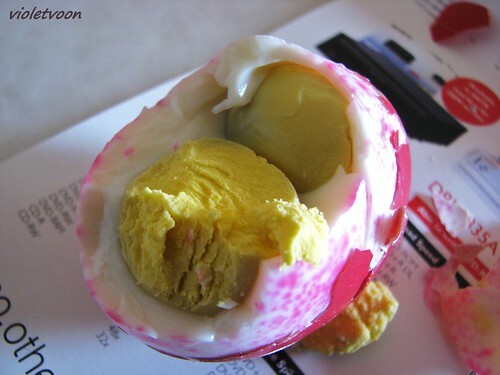 It's common for Chinese to eat red eggs during festivals or celebrations. I forgot and I left the eggs in my car. Yesterday noon I went out with Eling and I saw the eggs were still lying on the seat, I gave it to her, asked her to eat it later. At night, Kevin and I went to James wedding dinner in Hilton Hotel (I haven't organize the photos yet). I drank 5 glasses of red wine continuously, it was all because of Kevin, he wanted to make me drunk. Anyway, I wasn't drunk, not at all! :P Ermmm....sorry sorry, now I shall get back to the red eggs' story. 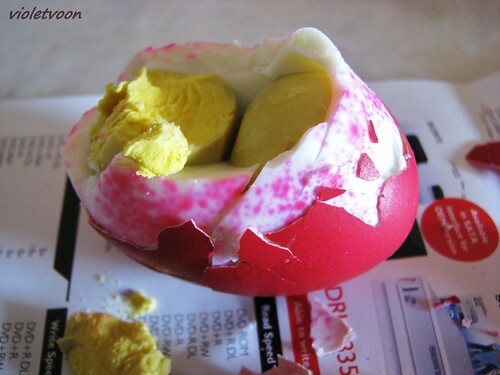 This noon before I got out, I saw the red eggs were still on the dining table. What la? Nobody wants to eat it? "Okay, I eat I eat." I talked to myself and I hoped the eggs weren't spoilt. But I thought it was rare, so I took out my camera for a few shots. 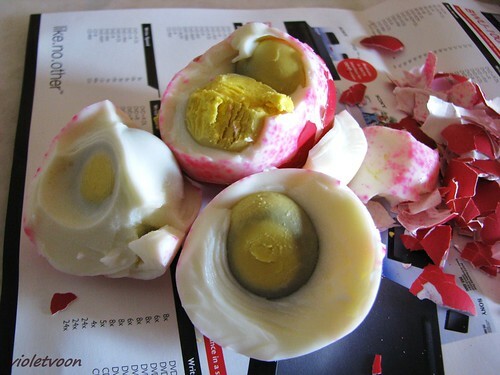 I dislike boiled egg, and now I swear I will never eat boiled eggs anymore! NO NO NO!!!!!!!!! I felt extremely weird and wanted to vomit. Tonight, I showed everybody these eggs.